Presentations of classic nursery rhymes recited by Mother Goose herself! There will be music and spoken sections, and many opportunities for participation by the children: dancing, music making, acting, and face painting. Over two dozen rhymes and fourteen songs, as well as riddles and games, will be taken from the Mother Goose books and turned into a living performance. 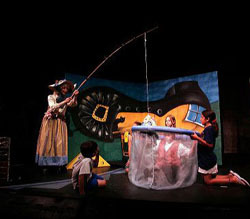 Mother Goose and her audience explore the seasons, the months of the year, the earth, and the heavens. 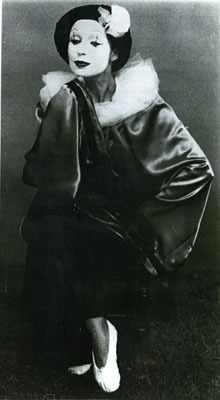 Activities such as sewing, eating, cooking, and taking care of animals are also among the subjects covered. Designed to spark creativity and stimulate the imagination. Schools performances: A typical visit will include two or more back-to-back 30-45 minute performances for each small class group (up to 25 students), thus allowing maximum interaction, or a slightly longer assembly-type performance for up to 150 children. Fee: $295 for two back-to-back class sessions; additional class sessions at a reduced rate of $60 if scheduled for the same half day; $350 for one assembly. Also available for birthday parties and private events ($295). 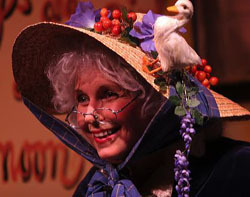 Lenka’s Mother Goose is also available for professional children’s theater series as a full-stage performance, with revolving set, scenery, props and costumes, and audience interaction. 60 min. Fee: $950, depending on technical media provided (stage lighting, sound, etc.). Contact Lenka for more information. 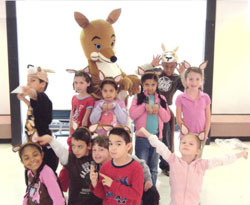 A pantomime learning performance for children, parents, and teachers. Lenka creates imaginary walls, involves members of the audience in tug-o-wars with imaginary ropes, pulls an imaginary puppy out of an imaginary box, and tells children’s stories -- all without saying a word!. The audience learns about the many things our hands can express, witnesses the Creation, goes to the seashore, and visits the circus. 45-50 minutes, large or small groups. Can be combined with the 45-60 minute Mime Beginnings Workshop exploring movement and dance, and elementary mime techniques. Fee: Performance $350; performance+workshop, $425; workshop alone, $195. 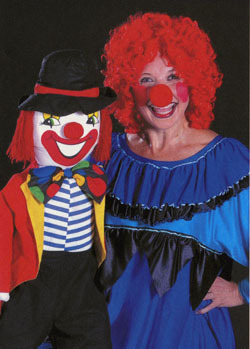 Lenka and her puppet Clownie-Clown Children dress as characters in the circus (tightrope walker, stiltwalker,jugglers, clowns, weight lifters, lion tamers, ring leader) and learn circus arts, miming, clowning, face painting, balloon animals. Also available for parties and events. 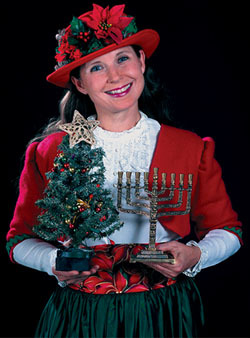 Christmas, Hanukkah, Kwanzaa, and other December festivals come alive in these exciting programs! 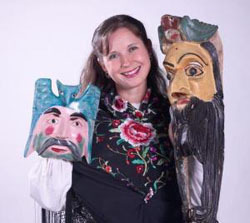 Story telling, myth, visual effects, song, and puppetry all combine into a multicultural experience. Both performances are filled with audience participation, stimulating artistic and learning experiences, and traditional cheer. 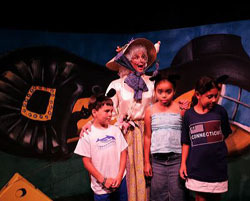 May also be presented as “A Visit from Mrs. Claus,” with Mrs. Claus herself appearing in the program! 45+ min. Book early, as demand is always very high! Fee: $395 for assembly performance; 2 perfs. $650; additional perfs. at reduced rate.